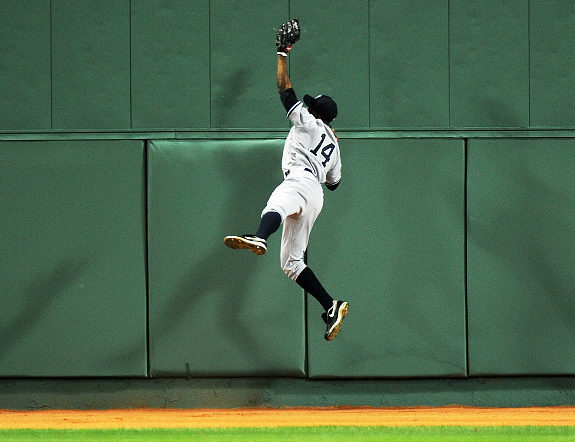 One of the positives in last night's Yankee loss to the Boston Red Sox was the performance of one Curtis Granderson. Grandy, as I enjoy calling him, went 1-4 with a home run and made a spectacular catch out in centerfield. Of course, it was Granderson's Yankee debut. If making his Yankee debut against the Red Sox at Fenway Park was stressful, he didn't show it. He took it all in stride. Taking it all in stride is what I was trying to do last night, as well. I was making my own debut of sorts. Like most Yankee fans, I am used to watching my favorite team in the comfort of my own home. I've done it for years, just as Grandy played centerfield in Detroit for years. Now, like Grandy, I'm in new surroundings. I live with 83 other women, most of whom are not interested in whether the Yankees win or lose. Now, instead of watching the games from the comfort of my queen-sized bed, I lie on a slightly comfortable twin bed, the headphones of a transistor radio in my ear, my Blackberry close by for tweeting. Not the best of circumstances, but I think that, in the same way Curtis Granderson was a good Yankee last night, I was a good Yankee fan last night. I will let nothing, not even being homeless stop me from rooting for my team. Go Yankees!